Lathan Goumas - lgoumas@shawmedia.com Diagnostic radiologist Christopher Goesel, M.D., looks at the mammogram of a patient while working in the Breast Care Unit at Advocate Good Shepard Hospital in Barrington, Ill. on Tuesday, Oct. 1, 2013. October is Breast Cancer Awareness Month. 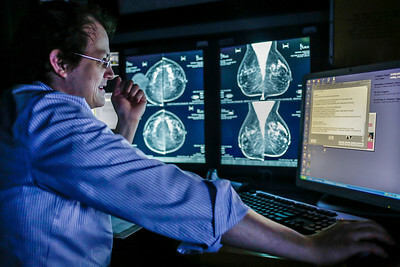 Diagnostic radiologist Christopher Goesel, M.D., looks at the mammogram of a patient while working in the Breast Care Unit at Advocate Good Shepard Hospital in Barrington, Ill. on Tuesday, Oct. 1, 2013. October is Breast Cancer Awareness Month.